A perfect example of the redboy/medlins cross. 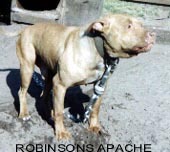 This dog produced a number of winners himself and produced many dogs that have proven to be producers themselves, one of the better Redboy/Medlins lines out there today. Thanks A.R.